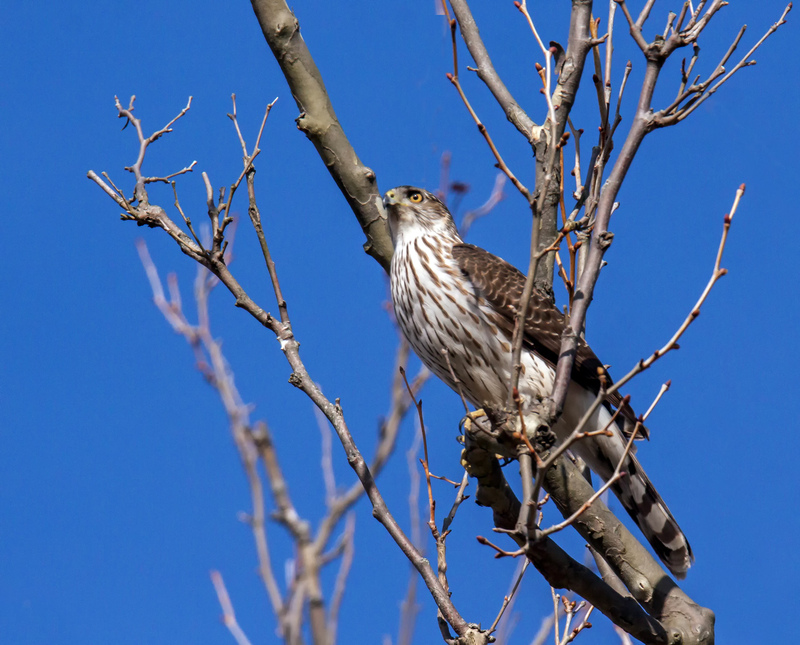 This past Monday I spotted this juvenile Cooper’s Hawk (Accipiter cooperii) high in a tree at Occoquan Bay National Wildlife Refuge. Initially there were a lot of branches between us, but I was able to move slowly and stealthily closer to the little hawk and get a relatively clear shot of it. I like how he’s in line with the main branch. The hawk was sitting more upright just before this shot, but I captured this image just it was getting ready to take off. I was shooting upward at a pretty steep angle, which made the bird look like it had a beer belly in the other shots. Very Nice Mike! It must be Coopers Hawk Week. We have a couple of Cooper’s Hawks in the trees by our car port. Enjoyed seeing yours! Such a noble pose! Beautiful shot, Mike.